If you think playing Temple Run on your phone is exhilarating enough, well, you definitely have not seen Temple Run VR! Steal the idol and set off on the run of your life in this thrilling endless runner game. 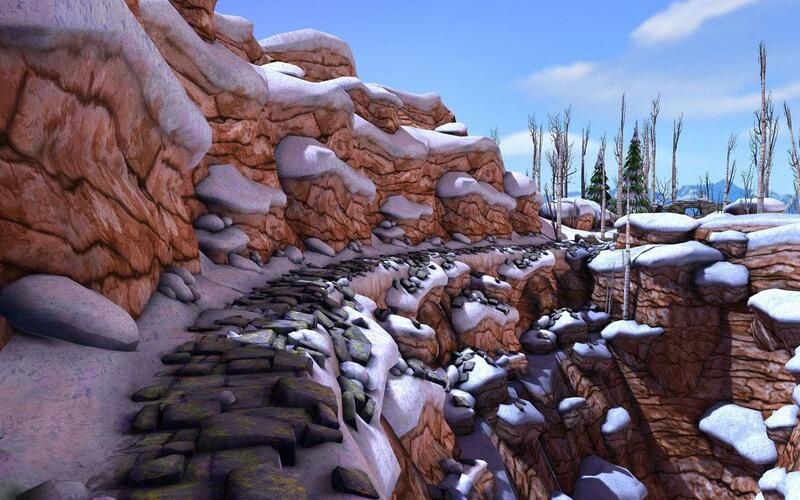 Navigate the treacherous paths while avoiding any obstacles in your way by jumping over it or sliding under it. Be careful not to stumble or you won’t be able to keep yourself away from the clutches of the monsters that are after you! Similar to the normal Temple Run game, you’ll need to rely on your quick reflexes to run safely across the beautiful snowy landscape in the game in an attempt to get away with your loot – a sacred idol. This is because the road you’re running on is littered with fallen tree trunks and rocks. If you cannot react fast enough, you’ll end up being the hearty meal of the monsters that are chasing after you. Generally, there are 3 lanes for you to move between, but sometimes, the path will crumble away into a chasm, leaving you with only 1 lane to run on. My advice? Don’t look down! There are even golden coins that you can collect to increase your high score, but of course, the main part of your score comes from the total distance you’ve managed to cover before your untimely demise. That said, the game does not feature any in-game shop for you to buy boosters or lives from. This also means that you can play Temple Run VR on your GearVR for as long as you like! 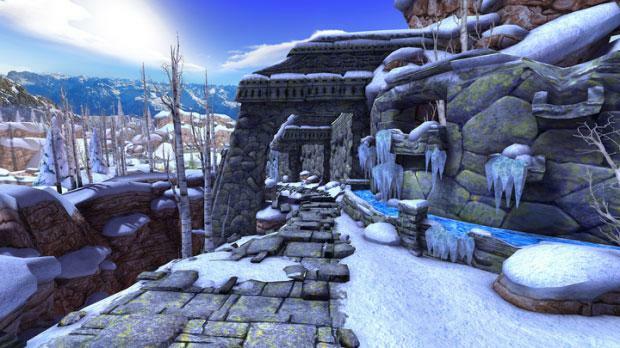 What’s interesting about the VR version of Temple Run though is that you can look around freely in the game. Do take a look at the beautiful winter wonderland in the game, or if you like, you could even turn to look behind you... at the hideously huge monster that is hot on your tail! Have you always wondered what the temple in Temple Run actually looks like? Well, now you can see every inch of the temple! 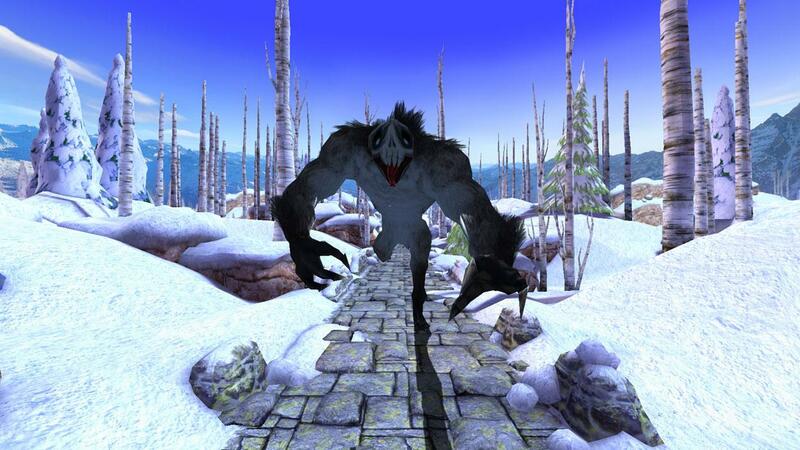 In addition to its view, Temple Run VR also utilizes the feature inherent in all virtual reality devices – head-tracking – to provide a whole new way of playing an endless runner game. Instead of swiping on your touchpad to switch paths, you can enable the head tilt option instead! Head tilt allows you to tilt your head to hop to the left or right lane a lot quicker than swiping. However, your head will need to remain tilted in order for you to stay on either the left or right lane. There is also a head look option that doesn’t seem to work. Perhaps it is a feature that will be implemented soon in Temple Run VR! Not to mention, the effect of sliding under tree trunks and low stone arches are much more pronounced in Temple Run VR. It does give you the feeling of actually sliding under something and needless to say, it is a very exhilarating experience... more so than playing the normal Temple Run on your phone, that’s for sure! Most importantly, this game doesn’t really cause the dreaded motion sickness effect despite being a rather fast-paced game. This is from my personal experience, by the way. That said, new VR gamers might want to give this game a pass for the moment, try another slower-paced game for starters, and then return to Temple Run VR when they are more accustomed to the effects of virtual reality. In short, playing Temple Run in virtual reality is an incredible way of playing this crowd favorite game. It definitely makes this endless runner game a whole lot more exciting to play, since you’ll actually feel as though you are the one being chased after by the monsters. The head tilt and head look options also allow you to play the game in brand new ways. Temple Run VR is most certainly a game that VR gamers, particularly GearVR owners since the game is available exclusively on GearVR, should try!